Several key principles are essential to creating any successful public space. These principles begin with numerous underlying ideas, the first of which is that the community is the expert -- the most knowledgeable and best resource for the professionals that are responsible for designing or managing the space. The second is that when one creates a "place," the entire project needs to be viewed differently. Partnerships are the third basic tenet because anyone who manages a space knows that it cannot be done alone. Finally, when embarking on a process for creating a successful space, one must accept that there always will be people who will say that it can't be done -- yet one can learn to work around the obstacles. Other remaining principles include techniques for planning and outreach, translating ideas into action and implementation. All 11 principles are illustrated below with recommended steps to ensure that the goals are reached, as well as case studies from GSA projects. To create any successful place, it is essential to find a way to uncover and incorporate people's talents. Tapping into the ideas and talents of a community - inviting into the process the people who have an interest or stake in a particular place, such as those who live or work there -- is crucial in deciding what will be done to develop or improve a place. These people know, from experience, which areas are dangerous and why, which spaces are comfortable, where the traffic moves too quickly, and where children can safely walk or bike or play. They provide perspective and valuable insights into how an area functions; overall, they have a unique understanding of the issues that are important. The sooner the community becomes involved in the planning for a public space, the better; it is ideal that they join before any work has been done. They also should be encouraged to stay involved throughout the improvement effort so that they become owners or stewards of the place as it evolves. 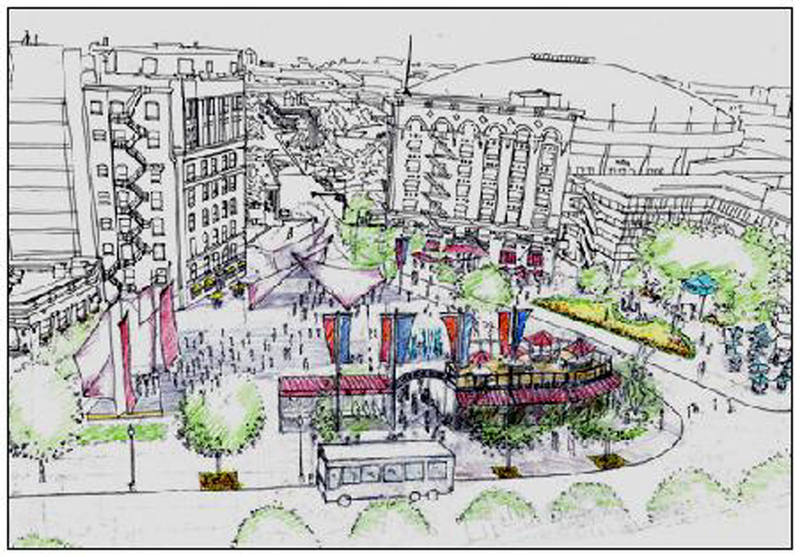 Working in conjunction with the GSA, the City of Fort Worth Planning Department developed and administered an online survey in order to get input from local residents, business and property owners, and other municipal agencies to guide the development of a new central square in the city's downtown. The concept was to include with the "square" several other spaces, including a city park adjacent to a federal plaza, a park adjacent to a hotel and office building, a space adjacent to a church, and the plaza in front of City Hall. The square itself was a private parcel currently functioning as a parking lot. The GSA and the City guided the project from concept to reality. Transportation served as the catalyst for the development of the square, with planners locating a bus transfer station and waiting area in the central square. The GSA will assume the management of the park in front of their building, and will implement short-term improvements there. Future activities for the space include a park-like setting for lunchtime use, with food and information kiosks; a public plaza with trees and a stage for events; a quiet, garden-like area with gazebo and café; an entrance plaza for city hall with fountains and a café; a major focal space with a large sculpture; and a formal garden. Define the community. List all the client and tenant agencies in the buildings, as well as the public agencies that have jurisdiction over sites on or adjacent to the property (e.g. transit agencies, Departments of Public Works, Departments of Parks, et al.). Include agencies in neighboring Federal properties, plus neighboring businesses, institutions, and residents. Survey tenants and client agencies about what they would like to see take place in the public spaces inside and outside of the building. Include uses, activities, amenities, and programming. Identify those issues of highest importance to the tenants, client agencies, and others defined as the community. Develop methods for expressing the mission of the particular federal agency to its constituencies and general public. Share this information with the project architects and designers to help shape the design program and agenda. When people describe a place they enjoy, they use words like "safe," "fun," "beautiful," and "welcoming." These words describe the intangible qualities of a true place -- the kind of place people talk about and return to over and over. Yet these "intangible" qualities can be measured quantitatively in a variety of ways, such as by using statistics or conducting research. Creating a place entails a broader view that goes beyond design; a successful public space possesses four key attributes: accessibility, activities, comfort, and sociability. These attributes depend on effective management and require the involvement of many different disciplines and interests. The GSA Center for Urban Development, together with the Montpelier Downtown Community Association (MDCA), embarked on a process to create a place in front of the Post Office, a building that was considered by many to be an eyesore. Although the lobby and post office facility had just been renovated, the community was disappointed. Residents felt that the building was still not integrated with the surrounding area -- it disrupted the visual continuity of Main Street and created an obstacle to pedestrians and shoppers. The community also realized that upgrading the façade of the Post Office would not be enough to solve these problems. The City, at the request of the Postal Supervisor, has introduced short-term, angled parking for customers in front of the building. This has slowed traffic through the Main Street corridor and made it safer for cyclists and pedestrians. A good public space requires more resources and expertise than any one individual or organization can offer. Partners can contribute innovative ideas, financial support, and/or in-kind goods and services. They can help collaborate on joint marketing, fundraising, and security activities that are difficult to organize for a single public space. Partners can also broaden the impact of a civic space by coordinating schedules for programming and improvement projects. Plus a strong partnership can move a project forward by giving it more political clout. The Fairchild Tropical Gardens is working with the GSA to develop and implement a landscaping plan for the plaza for the new Federal Courthouse in downtown Miami. An educational institution, Fairchild teaches children and adults about the flora of south Florida; it also works to reintroduce native plants into both residential and corporate landscaping. Fairchild's somewhat remote location (it is based 40 miles from Miami) has made it difficult to attract the specific audiences it has been seeking. Through a partnership with the GSA and its design team, Fairchild will operate an education center and shop on the Courthouse property, grow the plants to be used in the landscape plan, and help maintain the landscape around the Courthouse building. 4. They always say, "It can't be done"
But it doesn't always turn out that way. Because governments are compartmentalized and fragmented, public officials often have a limited ability to deal effectively with public spaces. Every city has myriad agencies that address issues that impact civic space, but unfortunately, few cities have a single department or person responsible for developing and managing public places. Also, the professionals responsible for activities that impact public spaces - planning, traffic, transit, recreation and education - often have larger mandates that make the creation of effective public spaces a secondary consideration. Therefore, when an idea stretches beyond the reach of an organization, and an official says, "It can't be done," what that usually means is, "We've never done things that way before." When people observe a space, they learn about how it is actually used, rather than how they think it is used. Observations enable people to quantify what would otherwise be regarded as intuition or opinion. By watching the ways people use a space, one can learn a lot about what the users want from it. People will often go to extraordinary lengths to adapt a place to suit their needs. For example, we have seen people use waste receptacles as places to sit, sort through their mail, and even cook clams. Actions like these clearly speak louder than words, yet they frequently confound the designers and managers of public spaces. About 30 people representing a variety of organizations, including the City of Helena, the Environmental Protection Agency, corporations and developers in the adjacent area, and local regional and federal GSA staff, met in the spring of 2000 to analyze the future site of a new federal building and courthouse in Helena, Montana. Using the criteria laid out in PPS' Place Performance Evaluation Game, the group measured the site's comfort and image, accessibility, uses and activities, and success as a space where social activities occur. The group identified such meta issues as the lack of connections between buildings and need to incorporate other partners (and their buildings) into the district; they also brainstormed about possible short-term improvements, including amending sidewalks, incorporating more "active" uses in neighboring building bases, and using the underpass to connect the area more effectively. Convene a workshop of stakeholders, tenants, and client agencies and do the Place Performance Evaluation Game, emphasizing the importance of looking at the existing area and what's going on there. Survey people who are using the space. Ask them to rate its attractiveness, use, sociability and connections to other areas. A vision for a public space essentially concerns the activities that will occur there in the future. Therefore, it should be defined primarily by people who will live, work around, and use the space, rather than the professionals or public agencies who are responsible for planning it. Every community is full of people whose ideas can contribute to developing a vision for a place. Professionals can help bring forth these ideas by asking people to think about other places they have been to and enjoyed, as well as talking with them about the activities that occur in those places and the physical elements that support them. This will help professionals evaluate the place that is being planned. Pictures of successful spaces (and even unsuccessful ones) are a good way of eliciting more discussion about the activities (or lack thereof) in a space, and they can help illustrate physical elements, character, types of management activities, and so forth. In order to identify both the amenities and activities that Department of Education employees would like to have in their soon-to-be renovated plaza in Washington, DC, 3,000 DoEd workers received an inter-email survey. The responses were included in the recommendations for the plaza, which were then incorporated into the project by the architect and urban design teams. This "community" vision was to create a central square showcasing innovations in education. 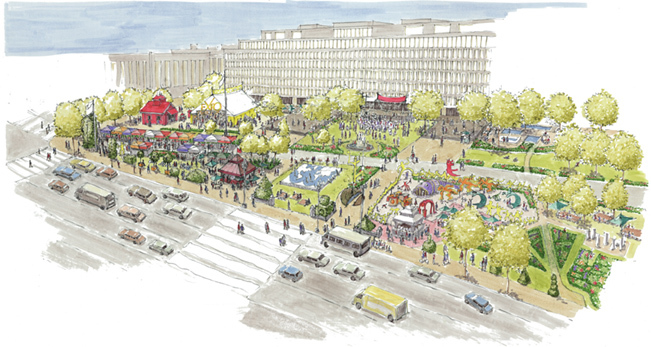 Specific ideas included a children's play area; a quiet area for employees to eat lunch outside; an outdoor café; expansion of the existing cafeteria onto the plaza, the creation of a performance area for noon-time concerts, and programming an annual Education Expo to symbolize the nation's commitment to education. The GSA and the Education Department have begun discussions with National Park Service and the City that will lead to the GSA gaining jurisdiction over the road and the park site to create its Education Plaza, a new civic space for Washington. The newly completed Moakley U.S. 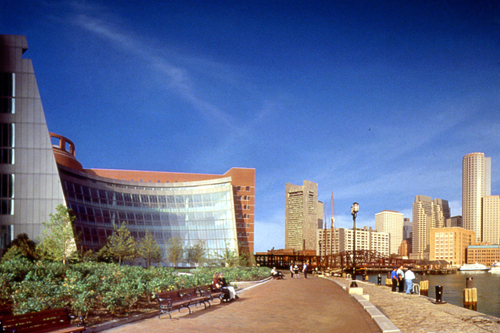 Courthouse is the centerpiece of Boston's revitalizing waterfront. In the three short years since its opening, the Courthouse has attained the status of a civic and architectural landmark; it anchors the eastern end of the Boston Harbor, and marks the current terminus of the Harbor Walk promenade. 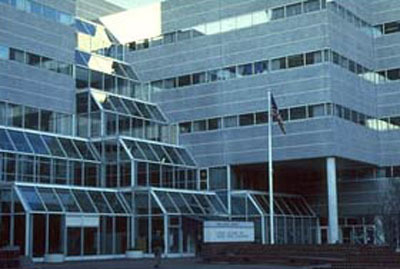 The significant investment the GSA made in the design, construction, and landscaping of this public building has spurred and encouraged other development projects around the Harbor, most notable the private redevelopment of two large parcels which lay between the Courthouse and the World Trade Center complex. The Courthouse -- once the "end" of the walkable Harbor -- will soon be a "middle." And as such, it could serve as a key connection point between the very active, public uses planned for the private development sites to the east, and the Rowe's Wharf area and city center areas to the west and north. The vision was to make the Courthouse a connector and a destination, not a place people hurry by on their way to the various museums, shops, and entertainment centers that are quickly populating the harbor. To do this, the Courthouse needed to have a special character, yet also engage the public by providing comfortable, usable, and flexible public spaces. In order to develop a vision and implement a program of uses for the public spaces around the Courthouse and alongside the harborfront promenade, the GSA, judges, and courthouse tenants convened a group of "Harbor Partners," many of whom are either building new facilities or renovating existing ones. After identifying how each could contribute to the project, the Harbor Partners are now working towards a common goal, with the Federal Courts as an equal partner. Identify and convene the stakeholders to discuss the broader, long-term goals of each stakeholder and the city at large. Brainstorm areas of overlapping goals and opportunities for cooperation. Identify issues that need to be resolved, keeping in mind the larger, long-term goals of the collective effort. Help people to imagine what the space could become and the activities that could go on there by asking them to think about other places they have been to and enjoyed; talking about the activities that occur in those places and the physical elements that support them; and showing pictures of successful spaces (and even unsuccessful ones). The most successful places grow out of understanding what a space needs to offer so that people will use it. However, in most cases, it is not until after a space is built that much thought is given to how people will use it; this is a major reason why much retrofitting goes on in failed public spaces: because the space's function was never seriously considered at the outset. In this respect, by following and incorporating the uses articulated by the community, a designer can not only make the a space interesting to look at and be in, but also very functional. A planned renovation of the Springfield Federal Building, located in the center of the downtown retail area, offers an opportunity to improve its under-utilized front plaza. The transit authority has funds available now to construct a new bus shelter at this location, which is the second most heavily used bus stop in the system. GSA and the transit authority are now discussing how best to coordinate their efforts: combined with a small amount of funds from the GSA renovation, it may be possible to make a portion of the plaza available for a spacious and attractive modular bus shelter that would also include space to accommodate food vendors. This would be a signature structure that will mark the plaza as a destination unto itself. The GSA has agreed to remove one of the planting beds, which will allow for better location of the new bus shelter, as well as provide better access and visibility for the plaza. The GSA will also purchase tables and chairs for the plaza, which will be available for use by the public and by the food vendors' customers, in exchange for the vendors keeping these amenities clean and securing them at night. These short-term improvements will be followed by a study of possible long-term changes to improve the relationship of the building to the plaza. The downtown BID believes it could recruit a restaurant for the IRS space, which could be re-located as part of the re-configuring of the interior space being renovated. A restaurant geared to evening use would complement the emerging club scene in the area, as well as providing more activity and, therefore, better security at night. Also to be studied is creating direct public access to the Armed Forces recruiting offices, as well as some kind of display facility on the plaza as well for this tenant, which depends on high visibility and walk-ins. Survey users and/or future users of the space about their needs and preferences. These may include your building tenants/employees, as well as the adjacent community. Conduct the Public Space Evaluation to determine what is working currently and what needs to be improved. The Evaluation gives designers direction in terms of what issues to address both in the short-term and long run. Develop a diagram of the functions that are to occur in the space and describe with as much information as possible. Locate the functions onto a plan of the site. The concept of triangulation relates to locating elements in such a way that the chances of activity occurring around them is greatly increased. For example, a bench, a trash receptacle, and a telephone placed near each other at a bus stop create synergy because together, they offer more chances for activity than if they were isolated from each other. Or, if a children's reading room in a new library were located next to a playground in a park with a food kiosk, more activity would occur than if these facilities were sited separately. On a larger scale, it means locating buildings near each other with easy access between them and active uses on the ground floor so that people will move between them. The Utah Transit Agency (UTA) and Ogden City have been discussing the design, orientation, and construction of a new IRS facility in Ogden City. UTA, which is building a new multi-modal transit facility directly across a state highway from the new IRS Building, has targeted IRS employees as potential transit riders and is offering to develop bus routes designed expressly to bring IRS employees from their homes to work in the downtown. 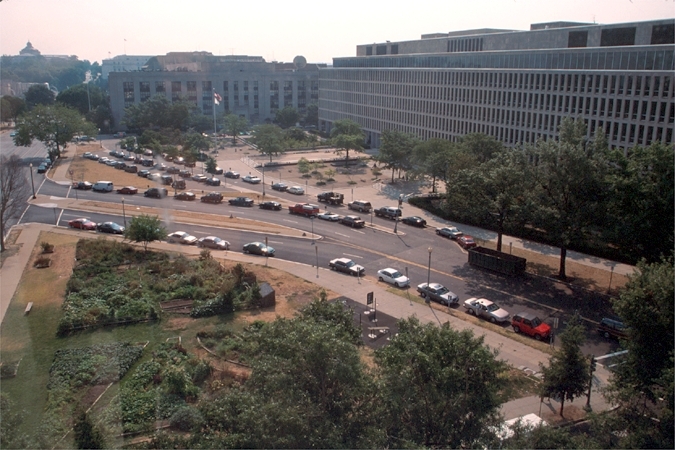 Having IRS employees take the bus means that the GSA can build fewer parking spaces and use the space around the building to create more outdoor public areas for employees. In order to do this, the street that separates the transit facility from the IRS building needs not only to become more attractive and safer for pedestrians, but also to function as a pedestrian-friendly gateway to the downtown. This result will be a shuttle that is supportive and encouraging to transit use, and a more attractive urban environment for IRS employees. The linkage between the new IRS and transit facilities, bolstered by a walkable street and well-placed, interrelated amenities, will set the stage for bringing the area to life. Conduct the Public Space Evaluation to determine existing conditions and relationships, as well as to assess opportunities for design, activities and amenities that could serve the public and energize public life. Outline triangulation opportunities on a plan of the site. Consider the location of various ground-floor uses that could be compatible and potentially work together. For example, if the day-care center was located next to the bus stop, with a coffee shop and event-information stand in the area, and perhaps a children's play people who were picking up their children may be inclined to stay in the area for a longer period of time. List the potential partners that could be brought into the process in order that the triangulation might be possible. To create a good public space requires more than long-term planning and large-scale changes. Many great plans become bogged down because they are too big, cost too much, and take too long to happen. Short-term actions, like planting flowers, can be a way of not only testing ideas, but also giving people the confidence that change is occurring and that their ideas matter. In many of the most successful public spaces, short-term actions occurred at the outset and were evaluated while longer-term planning was in progress. 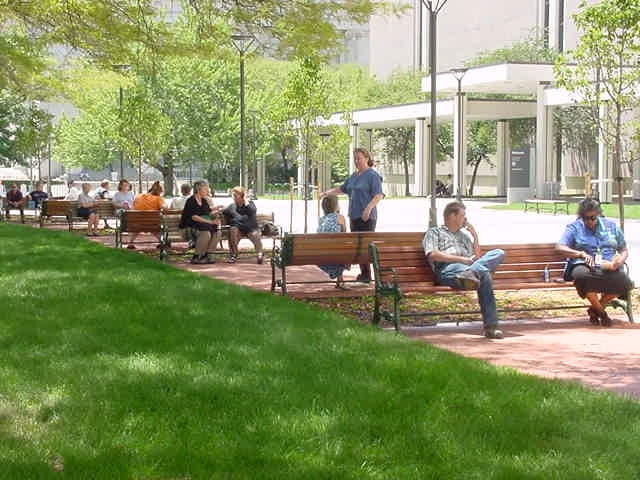 An example is a downtown park that was scheduled for a complete capital restoration. However, this was an expensive, long-term campaign; a preliminary step was to set up a book market in a tent structure in the park to draw positive activity. This experiment gave confidence to those managing the park's restoration, as it had demonstrated that uses such as this could draw people to the park. When the park was finally reconstructed several years later, similar types of uses were included in the plan. Good public spaces don't happen overnight, and people don't have all the answers at the outset. The key is to provide for flexibility - to grow the space by experimenting, evaluating, and incorporating the lessons into the next steps. 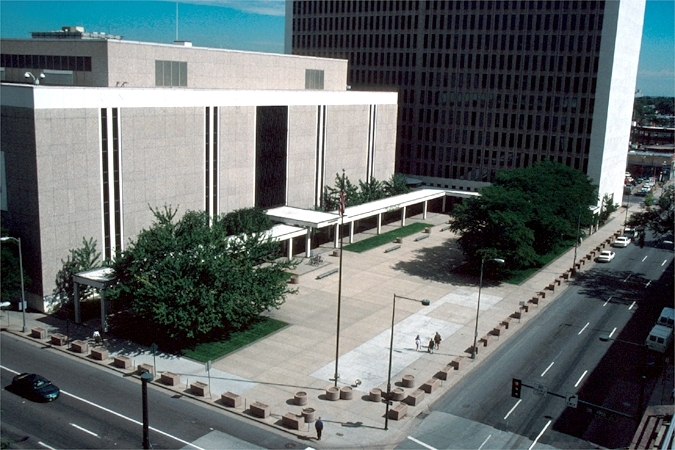 The area around the federal buildings in Denver, Colorado, was viewed by many as not only lacking a clear identity overall, but also confusing in terms of the location of specific buildings. In addition, the area was perceived as blocking -- rather than connecting -- the downtown business district and the residential neighborhood beyond. The GSA, working with local designers and area stakeholders, created a concept for a federal "district." Key to the plan were short-term changes that would make the area a friendlier, more pedestrian-oriented place. These machinations included both physical amenities, such as benches, plantings, and lighting, as well as management changes for the public areas. The lobby and plaza of one of the buildings in the District, the Byron White Federal Courthouse, were scheduled to be improved as part of GSA's First Impressions program. Using this project as an impetus, short-term improvements were made to the property while the larger plans were being finalized. The Denver GSA building managers leapt into action and purchased different types of benches that they could install and evaluate in terms of materials, location, and other elements. They also planted flowers in the stone security planters located along the perimeter of the plaza, added lights to the trees to enhance the area in the evenings, and scheduled events in the plaza. The changes were well received and gave the managers encouragement to continue their efforts. Convene internal GSA staff and building managers. Conduct the Public Space Evaluation. Identify short-term improvements that can be made. Implement improvements and evaluate the impact. All too often, the lack of money is used as an excuse for doing nothing. In fact, too much money often discourages the inventiveness, creativity, and persistence required to create a great place. When money is the issue, this is generally an indication that the wrong concept is at work, not because the plans are too expensive, but because the project does not leverage the resources of others. Funds for pure public space improvements often are scarce. In approaching projects, thus, it is important to remember the value of public space itself to potential partners. As mentioned, for GSA facilities in Syracuse and Chicago, the location, level of activity, and visibility of public spaces -- combined with a willingness to work closely with local partners -- can elicit partners' resources to activate these spaces. Small-scale, inexpensive improvements can be more effective at drawing people into spaces than major, big-buck projects. Inexpensive amenities such as vending carts, outdoor café tables and chairs, umbrellas, flowers, benches, or movable seating are relatively inexpensive and can get the ball rolling in creating a well-loved and well-supported public place. Developing the ability to manage a space effectively is more critical to success than a large financial investment. Management is the subject of our final principle, "You are never finished," but it's worth mentioning here that good management -- for example, the ability to put out items such as movable furniture at a moment's notice, to host a range of events, or to notice changes in the use of the space and to act on them -- are all ways that build a place's success more effectively and cost-effectively than just sinking in substantial capital. If the community is a partner in the endeavor, people will come forward and naturally draw in others. The community's involvement will lead to a sense of ownership that will engender people's support and contributions, which will in turn make a place grow and thrive. Such contributions are not necessarily monetary. They may come in the form of donated goods and services or volunteer labor, and consequently the cost of the project is diminished relative to the benefits received. When the community's vision is driving a project, money follows. Projects perceived by the public as being too expensive often do not become a reality, because they have not evolved from a community's vision. The most successful public space projects tend to use an incremental approach in which the place grows little by little; accordingly, people become more and more invested as it grows. Once a community backs a project with its voices and its hearts, money usually follows. When plans were being made to relocate Chicago's INS Building from State Street to South Clark Street, the GSA had several goals it wanted to achieve to transform the new location into a great place - one that would be a federal district gateway and community amenity, while also facilitating INS activities. One goal was to acquire city land abutting South Clark Street to add on for the building's front entrance and to accommodating ground-floor retail space. Another was to have the Chicago Transit Authority (CTA) do a facelift of the adjacent Blue Line Congress Avenue station. Other key goals included closing LaSalle Street (behind the building) and reshaping the 8-lane Congress Avenue (intersecting South Clark and LaSalle) for safer, easier pedestrian access and a generally more people-friendly environment. In addition to the GSA and INS, other public agencies were involved in the area at the same time, with their own specific goals. The CTA had $100 million from the FTA for Blue Line improvements, but weren't planning to include the Congress Avenue station. The City wanted the parking lot on LaSalle for an underground transit center and street-level access; before granting an easement for a closing, it might want the GSA to pay the lot owner's sale price of $750,000. Chicago's City Planning Department and Parks District were planning to invest $13 million for Congress Avenue improvements that would mainly be cosmetic, such as plantings, public art, and façade improvements. It was soon determined that if all of the interested parties worked together, they could achieve trade-offs that would result in a win-win situation. The City would make money from the sale of property to the GSA, and the GSA would have retail space and the revenue coming from that. The CTA would be able to build more convenient exits and enclosed elevator access (in the building) for the Blue Line, while GSA would see an upgraded Congress Avenue station. Although the City wouldn't receive the $750,000 from GSA, it would retain control of the LaSalle Street property. Finally, City Planning and the Parks District would accomplish a more impressive, far-reaching improvement of Congress Avenue, enhancing people's safety and comfort, as well as their aesthetic pleasure. This would create just the type of attractive, walkable environment the GSA had in mind. Look for trade-offs. For example, meeting a city's 10% coverage landscaping requirement by offering usable, desirable amenities, like seating. Find out what projects, master plans, studies, and initiatives are underway in areas immediately adjacent to your project site and in the city at large. Meet with the City and/or the Redevelopment Agency early on to find out what partnering opportunities may exist that will help you leverage your project and receive additional or higher standard design features, amenities, and/or services. About 80% of the success of any public space can be attributed to its management. No matter how good the design of a space is, it will never become a true place unless it is cared for well. Management is critical because good places are not static. The use of public spaces changes daily, weekly, and seasonally. Given the certainty of change and the fluid nature of the use of a place at different times, the challenge is to develop the ability to respond effectively. A good management structure will provide that flexibility. The establishment of an ongoing ambassador program was one important outgrowth of the Denver's Federal District's planning process. The program centers around a GSA-employed "ambassador" who moves around the building's public spaces answering questions, helping people who are lost, and forging ties between the adjacent community and the new district. The ambassador developed a business plan for the evolution of the program; that outline is being incorporated into the future planning for the district. Ideas that are being explored include programs that can occur in partnership with nearby businesses and institutions. The management-related issues that you would like to address as part of the overall improvement plan for the public space inside and outside of your building. Include the actions that need to occur for those issues to be addressed. The existing people or organizations who are involved in the issues already. For example, the downtown association may be doing programs and events, and these activities could bring life to your space if they occurred there; the transit agency may be looking to improve transit ridership, and could work with you to offer government employees incentives or name the transit stop after the government functions that occur in the area, et al. Outline the actions that need to occur, but are falling between the cracks. These items are the basis for developing the responsibilities of the site's management plan. It is possible that a new entity may need to be set up in some cases. This entity could be for-profit or non-profit, or be comprised of the GSA or other agency staff. Public space management is a full-time job, and should be treated as such.